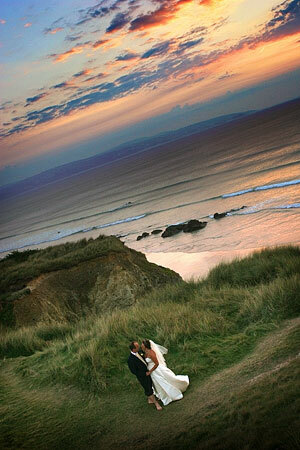 I am lucky to be a wedding photographer based near St Ives, Cornwall. St Ives has some of the finest beaches in Cornwall and the world which are fabulous settings for your wedding photography. Couples wishing to get married in Cornwall often choose St Ives because of its wealth of amazing scenery and wonderful venues such as Tregenna Castle, St Ives, Cornwall where you can celebrate your wedding by getting married outside with a backdrop of beautiful sea views. A walk along the cobbled streets of St Ives for Brides in their wedding dress is fun and the narrow quaint streets and coloured flowers make varied backdrops for your wedding photography. St Ives harbour is such a pretty place for wedding photos offering lots of photography opportunities. St Ives is a favourite location with wedding photographers. 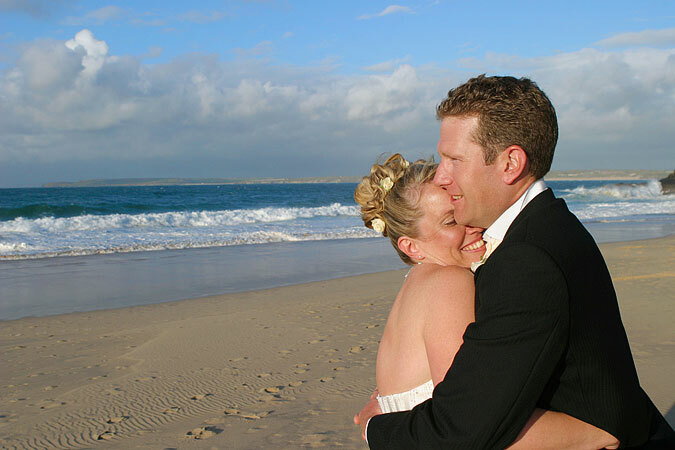 A visit to one of the fabulous beaches is always a special part of every couples' wedding day. Porthminster Beach, the first as you approach St Ives is one of my favourites. 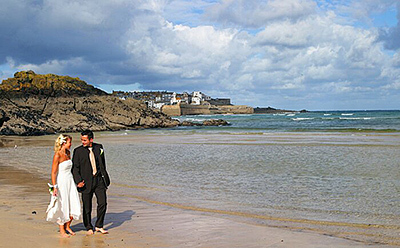 It offers completely different backdrops for your wedding photographs as you can look towards St Ives, out to sea and across St Ives Bay to Gwithian and Godrevy. The Parish Church in St Ives centre is a beautiful Church with grounds where I can take group photographs, of wedding parties, that will show St Ives in the background. St Ives also has a Catholic Church and Methodist Chapel where couples wishing to have a religious ceremony may get married. 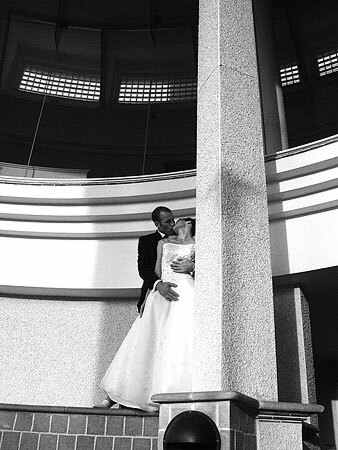 The wedding photograph of the bride and groom having a cuddle was taken on the couple's wedding day in October. 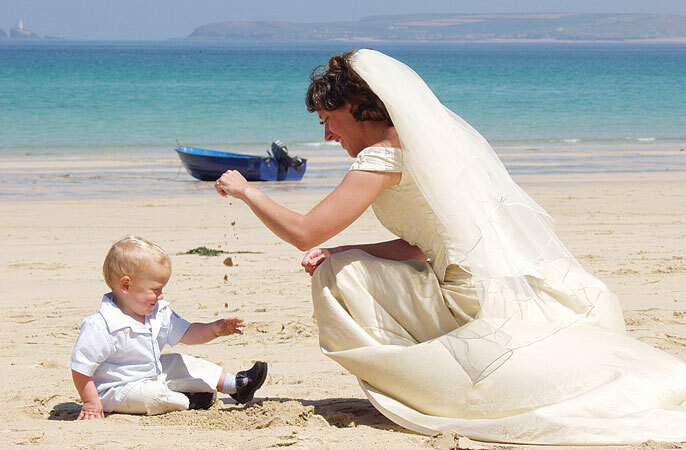 It features Porthminster Beach, St Ives and shows why St Ives is such a popular place for wedding photography. I wanted to capture the closeness of the bride and groom in a very sensitive way; they were obviously totally at ease - so important when creating wedding photographs with that special something. This wedding photograph was taken on Porthminster beach, and shows St Ives in the background. For couples getting married in St Ives or Carbis Bay there's always a beach nearby. The wedding venues in the St Ives area are blessed with amazing locations nearby that make fantastic backdrops for wedding photography. The standards of service provided by St Ives wedding venues is very high; I have seen considerable improvements as expectations have risen largely due to the increased popularity of St Ives as a destination wedding venue area. On a personal note I have photographed couples from around the world including Australia, America, Mexico and Sweden who have chosen St Ives for thier wedding celebrations. 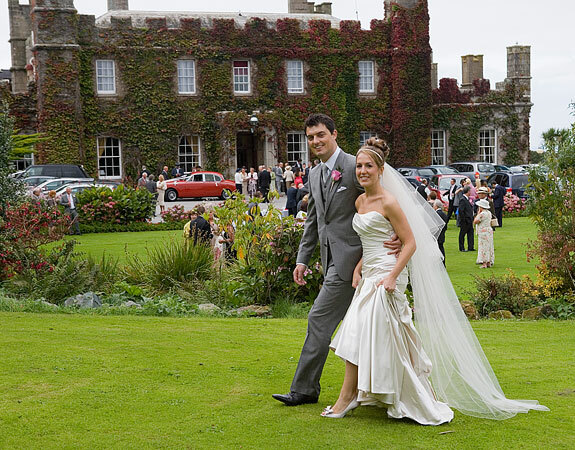 Tregenna Castle is a favourite wedding venue for me as a wedding photographer. There's a wonderful feeling of space with its well kept grounds and a great wedding co-ordination team who are backed by a professional team of staff and will ensure your wedding is one to remember. Whilst it has beach locations nearby, in the event of bad weather this venue has lots of space inside. This venue caters for many weddings every year and I look forward to picking up my camera to photograph the next wedding there - fingers crossed for good weather.